EAT.DRINK.THINK. : Behold, the Deviled Egg! 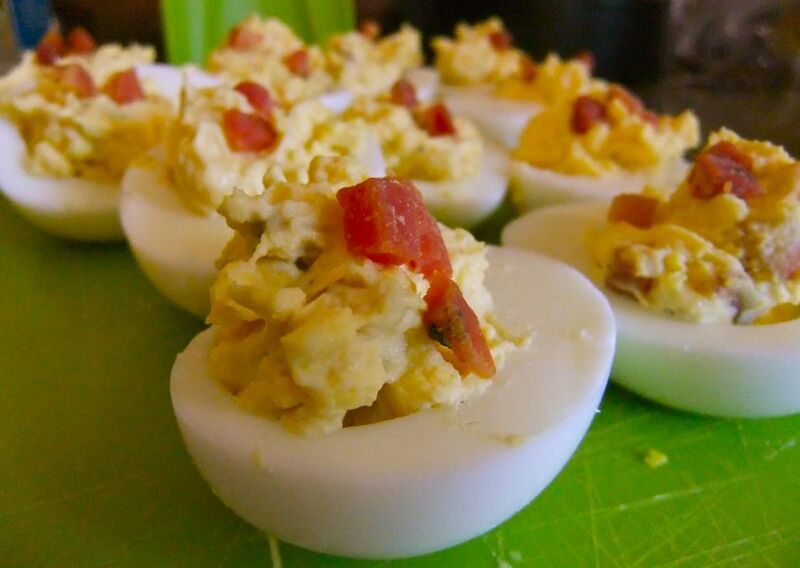 There is never a time when deviled eggs are a bad idea. N-E-V-E-R! You serve them as an app at a party or show up at someone's door with them and you, my friends, have instantly risen in everyone's esteem. There are a few unfortunate souls who can't take the egg (all is forgiven DOR) for whatever reason. 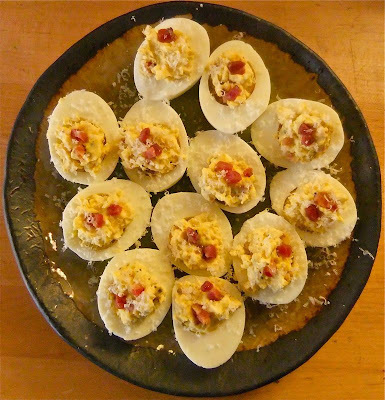 But for those who do, which is seemingly 98% of the population, the deviled egg is usually lusted over. Maybe it's the feelings of childhood memories it brings back. Certainly in my case it is. I always remember my mom's eggs, and those rare occasions we'd have them were highly anticipated. She didn't do anything fancy....a little mayo, some yellow mustard, salt, pepper...that's about it. Didn't matter. Instant happiness. A note on boiling eggs: the key to the perfect deviled egg is of course a clean, just done yolk. One without that rim of blue-grey that comes from cooking it too long. Here's what I do that seems to work like a charm- add the desired amount of eggs to a large sauce pan and cover with cold water. Place on high heat and bring to a boil. When the water comes to a full boil, remove the pan from the heat and cover. Let the eggs sit for 16-18 minutes, then remove lid from pan, drain water, and run cold water over the eggs to stop the cooking and cool the eggs down for easier peeling. You should have perfectly yellow yolks with which to work your devilish magic.